In November 2018, Ms. Sgroe will debut with Center for Contemporary Opera in Laura Schwendinger’s Artemisia, singing the lead soprano role of Susanna. Most recently, Ms. Sgroe made her Jordan Hall debut in concert with The Shakespeare Concerts in April 2017 in works by Joseph Summer, Schumann, Brahms and Pesestky for voice, harp and horn including World Premieres by Summer and Pesestky. This was repeated at UMass Amherst and a commercial recording of this project is forthcoming. Read a review in The Boston Music Intelligencer here. 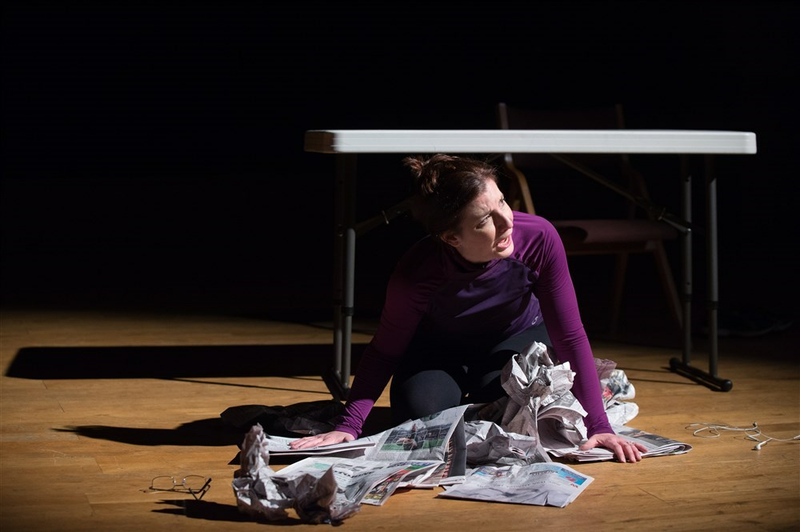 Also in April 2017 Ms. Sgroe reprised her performance of Jessica Rudman’s monodrama “Trigger”, about the effects of domestic violence, for the Women Composer’s Festival of Hartford on the program “Gendered Violence in Music”. Jennifer sang the US premiere of Rudman’s “Trigger” with Hartford Opera Theatre in November 2016 and will repeat this performance for the third time in Winter 2018 in a newly orchestrated version on a program of works by Jessica Rudman titled, Speaking her Truth. In recital, she continues to offer performances of the original recital program, To the Sea, developed with her collaborator, pianist Beverly Soll. Originally premiered in July 2016 for the Nahant Historical Society, and inspired by the sea, this narrated-program explores Americans, particularly New Englanders, and their relationship to the sea. A dozen composers and as many poets are represented, most of whom hail from the New England region; featuring works by Duke, Hundley, Rorem, Wheeler, Chadwick, Foote and others. Upcoming performances include venues in Boston, Rockport, MA (October 2017) and others across New England through Summer 2018. Other recent opera and concert performances include The Boston Singer's Resource Celebration of American Song Retrospective Recital, Soprano Soloist for Cambridge Symphony's Holiday Pops Concert, Soloist for the 15th Anniversary Concert with Arbor Opera Theater, Miranda (cover) for Joseph Summer’s premiere of The Tempest, Mabel (Pirates of Penzance) with New England Gilbert & Sullivan Society & Longwood Opera,﻿ Gretel (Hänsel und Gretel) with Sinfonietta Nova, Soprano Soloist for Hindemith’s Das Marienleben with One World Symphony, Susanna (Le nozze di Figaro) with Arbor Opera Theater, Lula/Lightfoot McClendon cover (Cold Sassy Tree) & Curley’s Wife (Of Mice & Men) with Sugar Creek Opera. Highlights from past operatic performances include Adele (Die Fledermaus), Romilda (Xerxes), Pamina (Die Zauberflöte), Monica (The Medium), Greta Fiorentino (Street Scene), Drusilla (L’Incoronazione di Poppea), Phyllis (Iolanthe) and the premiere of the role of Esther in Scott Wheeler’s Democracy (American Opera Projects). Past performances have been with Utah Opera, Commonwealth Opera, Amherst Early Music Festival, New Trinity Baroque, Knoxville Symphony, Lexington Philharmonic Orchestra, Opera del West, Opera New Hampshire, for the General Assembly of The United Nations, and at Carnegie and Radio City Music Halls. Ms. Sgroe is also an active recitalist, having collaborated with pianists Cliff Jackson, James Busby, Nan McSwain and Beverly Soll.﻿ Recent recital programs have included a survey of 20th Century American opera arias, an introduction to the art of the song recital, and a program which investigates the connection between the human spirit and the natural world through song, poetry and photography. Internationally, Ms. Sgroe has been heard as soloist at the Sastamala Gregoriana Early Music Festival in Karkku, Finland, The Dartington Festival (United Kingdom) under the direction of conductors Graeme Jenkins and David Temple and with the AIMS Symphony Orchestra (Graz, Austria). Highlight concert performances include the Angel in Handel's Jephtha with Graeme Jenkins, and soprano soloist in Brahms’ Ein Deutsches Requiem with David Temple at Dartington, Handel’s Messiah, the Pergolesi Stabat Mater, and Schubert’s Mass in A-flat Major in Graz, Austria with Cornelius Eberhardt. This past February she participated in the 25th International Vocal Competition of Centre Lyrique, Clermont-Ferrand, France as an internationally selected participant. She was an International Semi-Finalist in the 2013 Oratorio Society of NY Solo Competition, a winner of the National Opera Association Vocal Competition, the Settimane di Lugano International Festival Competition, the 2010 David Adams Art Song Competition, and the 2010 Opera New Hampshire Vocal Competition. She won 2nd place in the 2010 Boston area NATS Artist Award recital competition and went on to represent Boston as a New England Regional Finalist. She has been named a NATS Foundation Award Winner and a Liberace Scholar for Excellence in the Creative and Performing Arts. Ms. Sgroe was also a grant award recipient from the Massachusetts Cultural Council, which resulted in her aforementioned "To the Sea" recital program. She continues to reprise this program across New England into the 2017-2018 season. Jennifer Sgroe is also a seasoned teacher, administrative leader and producer, having put her talents to use in various sides of the performing arts and within academia. Dr. Sgroe has been teaching voice for over seventeen years at the university level, in private studio and community music schools. She is a proud member of the National Association of Teachers of Singing (NATS). Past university teaching positions include New York University, the University of Kentucky and Transylvania University as an instructor of voice and diction for singers. She also has a background in opera outreach education having worked with several opera companies as a teaching artist, including Utah Opera, Opera New Hampshire, Opera of Central Kentucky and Lexington Opera Society. In March 2011, she joined the Voice Faculty of New England Conservatory’s Preparatory & Continuing Education Division and held the role of Chair of the NEC’s Preparatory Voice Department from Fall 2011 - Spring 2015. During her time as Chair, she developed the Prep Voice curriculum to include age-appropriate class voice training opportunities for young singers, class piano for singers, the very first musical theater courses in the history of the conservatory and the masterclass and workshop series. This year marks her seventh year on the faculty at NEC Preparatory School and the School of Continuing Education, where she also works with adult singers of all ages and levels, including recent college graduates, former Preparatory School alumni, members of the Tanglewood Festival Chorus, actors, and professionals from all walks of life who choose to continue to develop their voices and musical gifts. L to R: J.Sgroe, E.Kendrick, E.Krauss - 3rd Place, J. Petersen, R. Beauregard - 2nd Place, L. Hassan - 1st Place, A. Del Santo, Jim Hay, pianist. From Fall 2014 - Summer 2017, Dr. Sgroe served as Head of Vocal Studies/Musical Theater and Assistant Professor of Theater at Dean College where she led the Musical Theater concentration. At Dean College she developed the Musical Theater concentration, overseeing the voice training curriculum, teaching Vocal Technique for the Stage, Voice and Speech, Musical Theater Repertoire and Musical Theater Performance classes. She also served as lead vocal coach for all of the mainstage musicals at Dean and regularly offered departmental voice masterclasses, studio classes and coachings in preparation for upcoming competitions, recitals and senior showcase. Past shows include Urinetown, In the Heights, Hair, Into the Woods & American Idiot. In the three years of her tenure, Dean College singers won or placed at the District, Regional and National levels of the NATS Student Auditions and Dean College singers were named Regional and National Winners in the Kennedy Center for the Performing Arts Maltby Awards. She has also served on the faculty of Emerson College’s Musical Theater faculty teaching Musical Analysis II to Musical Theater majors. Her voice students have gone on to study at leading college and summer programs including: NYU New Studio on Broadway, Berklee School of Music, UMass Amherst, Amherst College, Elms College, Harvard University, University of Chicago, Cornell, University of Michigan, Pace University Actor’s Studio, Carnegie Mellon, Hartt School of Music, Bard College, Interlochen Summer Music Program, Boston Conservatory Vocal Choral Intensive, Boston University Tanglewood Institute, Bel Canto Institute, University of Oklahoma City Summer Music Program, Westminster Choir College Solo Vocal Artist Program and Oberlin College Vocal Academy. Dr. Sgroe’s experience as performer, academic, pedagogue and administrator, is further enhanced by her experience as producer and musical entrepreneur for the past sixteen years, developing and executing a variety of successful musical programs and events across genres and in collaboration with varied musical ensembles and performers including a The Spirit of America Benefit: For the Victims of 9/11 Fund in September 2001 in Lexington, KY. Produced in only three short weeks, it raised $40,000, involved over 300 performers, seven different performing groups and reached an audience of more than 1,400 in one night. She is currently developing the Refugee Voices initiative, a concert project of newly commissioned vocal, choral and orchestral music which will amplify the stories of refugees through song. Originally from New York, soprano, Jennifer Sgroe now resides in historic Salem, MA with her husband Matt and maintains a private studio in Salem, MA and in New York, NY. Bring Jennifer to your venue or institution as a guest recitalist. Collaborate with Jennifer on the development of a new vocal work. Discuss Concert and Opera opportunities with your company. Get involved with Refugee Voices as a composer, performer, sponsor, presenting organization or production assistant. Learn more about Voice Lessons in Boston, Salem or NYC. Read an abbreviated Teaching Statement. Read more about past Guest Masterclasses or Special Workshops.